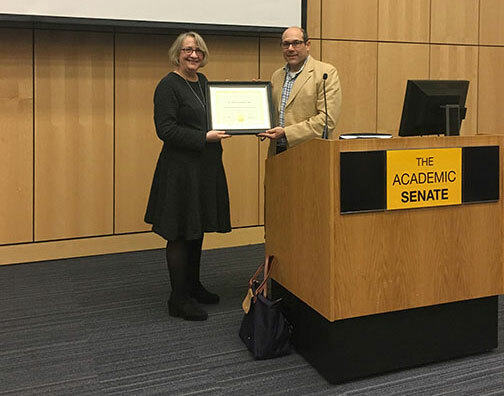 Ruth Greenblatt, MD, was selected by her peers on the Academic Senate’s Committee on Research (COR) as the seventeenth annual Faculty Research Lectureship (FRL) recipient in Clinical Science. Greenblatt is a Professor Emeritus in the UC San Francisco Department of Clinical Pharmacy, where she chaired the UCSF School of Pharmacy Faculty Council. When she first began at UCSF, her primary appointment was in the UCSF School of Medicine. She was full-time faculty at the time of her selection as the FRL recipient in Clinical Science. The event took place Thursday, Oct. 5, 2017 in Cole Hall on the Parnassus campus. The event was live simulcast and is available for viewing for one year. The FRL series began in 1957 with a basic science award and in the following years grew to include clinical and translational science awards. Clinical science focuses on bedside research, or faculty who study human subjects in person through surveys, case series, or case-control studies. The FRL awards are given to three separate, distinguished faculty members each year. After UCSF faculty submit nominations, the Senate’s COR makes the final decisions. Greenblatt’s research has found distinct phenotypes of HIV disease in women that led to improved clinical trials methods and information on experimental treatment outcomes for women and racial minorities. Specifically, Greenblatt’s HIV research studies include: susceptibility to HIV, the effects of ovarian aging and menopause on HIV, and anti-retroviral pharmacology. Born in Wisconsin, Greenblatt grew up mostly in Maryland. In high school, Greenblatt completed her first bench research project on phospholipids cycads. She attended Case Western Reserve University (CWRU) in Cleveland, receiving a Bachelor of Science in chemistry and psychology and her MD. At CWRU, she completed bench research in radiation biology, field research on anemia in Navajo children in Chinle, Arizona, and field research on schistosomiasis in Kenya. The AIDS epidemic was first identified in 1981, the same year Greenblatt graduated from medical school. Following CWRU, Greenblatt attended University of Washington for an Infectious Diseases Fellowship, which allowed her to return to Kenya to do bench and field research on genital ulcer disease (GUD) and HIV. Greenblatt came to UCSF as part of the Robert Wood Johnson Clinical Scholars Program in 1986, which funded up to three years of graduate-level, or post residency research. The program places individuals at multiple sites; Greenblatt was assigned to UCSF, one of her top three choices. During that time, Greenblatt did behavioral and field research on teen risk, disability, alternative treatments, and accuracy of medical records. “After completing my fellowship and residency at UCSF, what kept me here was the people,” Greenblatt said. Greenblatt’s career at UCSF has seen collaborations with the UCSF HIV/AIDS Program Clinic, the Women’s HIV Program at UCSF (WHP), and the Bay Area Research Consortium on Women and AIDS. 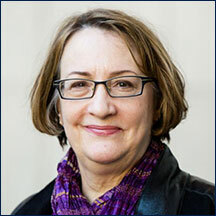 What has taken up most of Greenblatt’s time at UCSF is her role as a Principal Investigator (PI) for the Connie Wofsy Women’s HIV Study (CWWHS), which is a regional cohort research study that contributes information to the Women’s Interagency HIV Study (WIHS). WIHS began in 1993, and is the largest HIV study of women with HIV, and is an ongoing nine-site study of many aspects of HIV among women in the US. For the past few years, Greenblatt has collaborated with a team of three other researchers on the CWWHS leadership cohort, including: Project Director Jennifer Cohen, MPA; Principal Investigator Bradley Aouizerat, PhD; and Principal Investigator Phyllis Tien, MD, MSc. A few findings that have come from WIHS research include: development of standard approaches adequate for prevention of cervical cancer, HIV suppression reduces the risk of cervical epithelial neoplasia, and HIV positive and negative participants show peripheral vascular disease at an early age. Greenblatt has collaborated with twelve other UCSF faculty through the WIHS study. Now as an Emeritus Professor, Greenblatt’s schedule has changed, but she still serves on the CWWHS leadership cohort as a PI. They hold a monthly video call and at the beginning of the year, the leadership cohort will change. 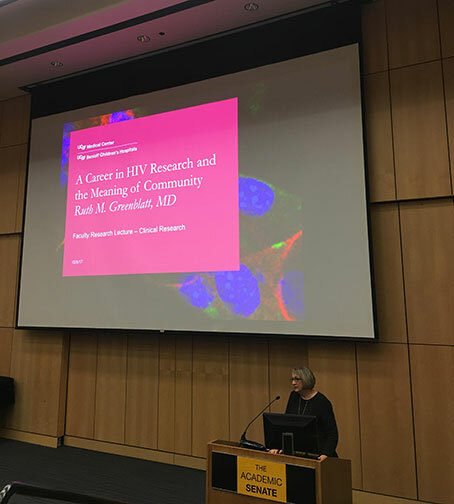 “We bring diversity within this research cohort by having professionals from different schools and we recruit researchers from different areas outside of HIV, like lung and heart,” Greenblatt said. Outside of UCSF, Greenblatt enjoys spending time with family, sewing, and quilting. The next FRL events will take place on Dec. 7 for translational science research and on March 8 for basic science research.